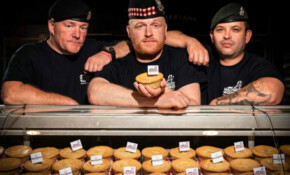 Launched during Armed Forces Week to support Walking With The Wounded, 50p from the £1.10 pie will be donated to the charity which helps ex-servicemen and women transition successfully from the military to civilian life. Get your own ‘Royal Wedding Cake’ for just £7! Here's something to whet the appetite of fans of the Royal Family on the Isle of Wight - One supermarket in Newport has created its very own version of the Royal Wedding cake, as well as Meghan Markle’s wedding bouquet.